Western blot analysis of extracts from A-431 cells serum starved overnight, and left untreated (-) or treated (+) with EGF (100 ng/ml, 15 min), using Phospho-EGF Receptor (Thr669) (D2F1) Rabbit mAb (upper) and EGF Receptor (D38B1) XP® Rabbit mAb #4267 (lower). 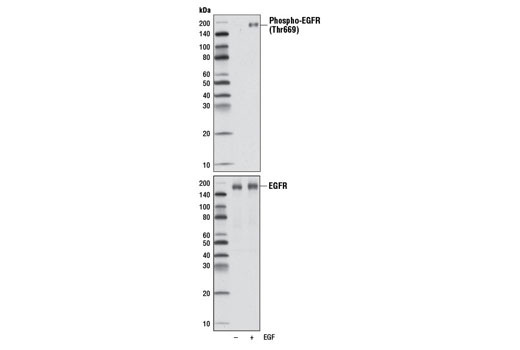 Phospho-EGF Receptor (Thr669) (D2F1) Rabbit mAb detects endogenous levels of EGFR protein only when phosphorylated at Thr669. While the literature refers to this residue as Thr669, it is Thr693 of human EGFR (UniProt sequence P00533) and corresponds to Thr695 of mouse EGFR or Thr694 of rat EGFR. Monoclonal antibody is produced by immunizing animals with a synthetic phosphopeptide corresponding to residues surrounding Thr693 of human EGFR protein. Thr669 (equivalent to Thr693 of human EGFR) is phosphorylated by p38 MAP kinase following EGF stimulation (11). Phosphorylation of EGFR at Thr669 may be involved in regulation of ligand induced receptor internalization through interaction with specific downstream EGFR tyrosine kinase substrates (11). Winograd-Katz, S.E. and Levitzki, A. (2006) Oncogene 25, 7381-90.